Most rod tubes seem to be on the unecessarily heavy side for backpacking. On the other hand, the true-believing lightweight backpacking types would likely scorn any rod tube at all. However the cost of the higher quality fly rods and the fact that fishing is my main motivation to go into the wilderness left me looking for some form of lightweight protection. What I came up with is a tube made from thin wall 2" diameter PVC downspout tubing and blue foam pad material. This is the stuff the tougher backpackers use for sleeping pads. It's available at REI. Other items needed are contact cement (I recommend Barge Cement), PVC pipe cement, and some Velcro(R), a 2" hose clamp, and a needle and thread. 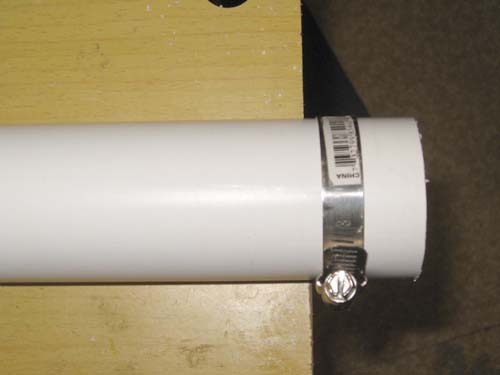 Here is the completed tube with its closure plug. It is held closed with Velcro, 3/4" wide strips glued and stitched to the tube and its plug. Here's a detail of the plug. 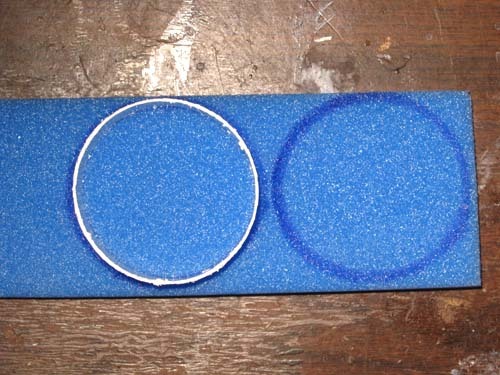 It' a rolled up piece of blue foam glued to itself with contact cement and to a PVC ring with pipe cement. The tube should be cut to the length of the rod in its sock plus 2 inches. Use a hose clamp on the tubing to line up a nice square cut of it. Cut a 3/4" wide ring for the plug. A coping saw or a hacksaw will do the job. 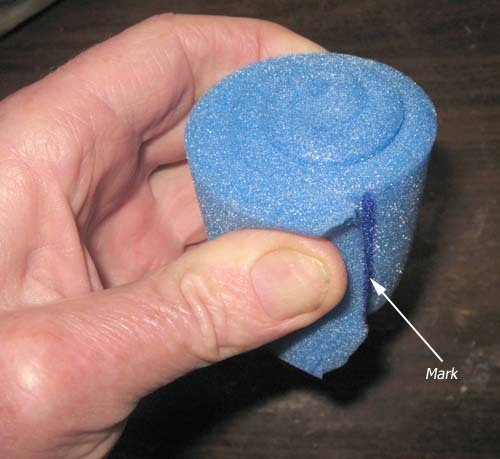 Also make the bottom closure from blue foam. Draw around the outside of the plug ring with a felt pen, and cut it out with scissors around the outside edge of the drawn mark. You want to have to compress it a little bit to get it into the end of the tube. Make two of these and glue them together with contact cement . To use Barge Cement, coat both surfaces to be glued with cement, let them dry 15 or 20 minutes, and then being careful of alignment, put them together. Then glue the assembly into the end of the tube with pipe cement. Have a long enough stick handy so you can push it back square with the end of the tube if you push it too far in. Pipe cement sets pretty fast so you don't have much time. Next glue some 3/4" wide hook Velcro to the end of the tube and the plug ring with pipe cement. To do this, smear the back of the Velcro with cement. Put it in place, and hold it there until it sets with a rubber band or two. 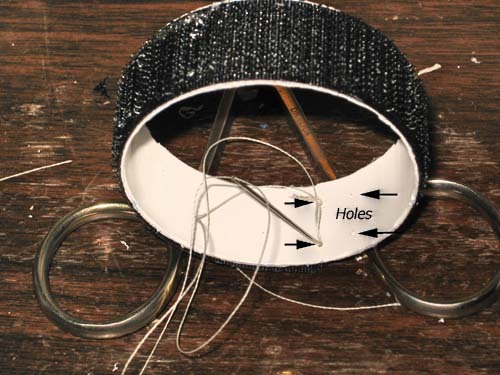 Next with a very small drill, make two holes on each side of the Velcro where the ends meet, and with a needle and thread stitch it down. For extra security, make two holes opposite where the ends meet, and stitch that too. Do this to the plug ring and to the tube. You might ask why I don't just use adhesive backed Velcro for this instead of going to this trouble. The answer is, it doesn't stay stuck. This does. 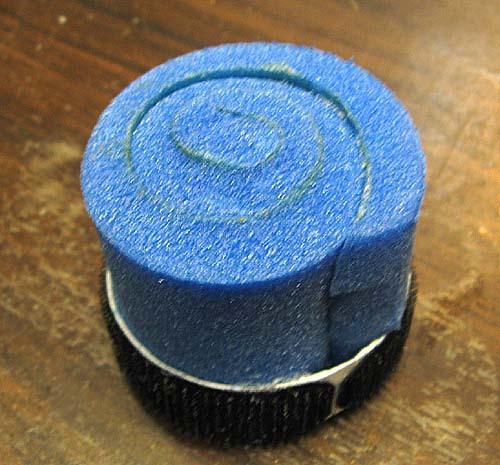 Cut an 11" x 2" strip of blue foam for the plug. One end should be cut on the diagonal so it will blend with the curvature of the plug ring. Roll up the strip tight from the square end. Mark the point of the roll where it ends. Coat all of the back side with cement and the front side up to the mark. After the cement is ready, roll it up and secure it while the cement sets with rubber bands. Then glue it into the plug ring with pipe cement. A strip of 1 1/2" or 2" pile Velcro hold it closed completes the job. I have a lot of the stuff on hand and will gladly sell it to you at cost. No need to buy a 10' piece of tube or huge piece of blue foam to make one of these.